Remember iPods? Not that long ago, they were the only way people listened to music, peaking at 23 million units sold in Q1 2009. Six years later, that number had dropped to zero. The one-two punch of phones in our pocket and streaming music created a superior option. We never looked back. The annual fixed-price contract is the current go-to for ocean freight procurement. But, much like the iPod, which was admittedly a great device, there’s clearly room for improvement. Tenders can take BCOs (Beneficial Cargo Owners) three to five months of preparation, but despite this, the fixed price often breaks down during peak season. 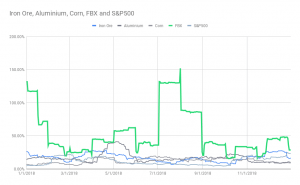 Fixing a price is almost futile in a volatile market, and ocean freight now has much more volatility (both frequency and magnitude) than most other commodities. But it doesn’t have to be like this. Just like streaming replaced that iPod as a better way of listening to music, ocean freight procurement now has a better way. Time to go with the stream. The iPod’s demise was abrupt. Just like the analog tape when CDs were introduced, and CDs when hard drives appeared. Then, the entire concept of music storage was rendered moot by streaming. Technology rewrote industry rules and improved our listening to music. The same phenomenon has been replicated across other industries as well, from hotel booking (Priceline giving way to Airbnb) to glasses (LensCrafters to Warby Parker). But Does Fixed Ocean Price Procurement Need Fixing? There’s one group of people who know the answer better than anyone – the logistics providers and BCOs who literally spend their lives on tenders. So we asked them by conducting a survey in November 2018. Approximately eighty top-tier logistics providers and BCOs responded, mostly director-level supply chain professionals representing companies with over half a billion dollars in annual revenue. What came through strongest in their feedback was frustration with the current process. For example, logistics providers reported that unless they paid extra during capacity crunches, 25% of their shipments failed to make the first available sailing. 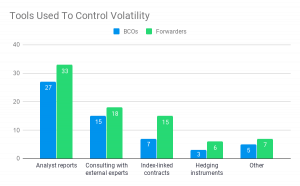 Then getting that shipment onto the right sailing proved difficult for logistics providers, with 75% acknowledging having renegotiate or deviate from the BCO contract. For BCOs, it adds up to a significant commercial impact (3.9/10 rating). And this happens despite the considerable effort involved in getting to a fixed price. Global logistics providers have large teams working full-time on nothing else. The problem is that even with the help of consultants and analyst reports, they’re essentially guessing. Even without unanticipated phenomena like President Trump’s tariffs or 2016’s Hanjin collapse, ocean freight pricing is still highly volatile. Guessing in a volatile market creates a must-lose dynamic. If market rates come in lower than the fixed rate, BCOs lose and may be drawn to the spot market, breaking minimum commitments (MOQs) and using other logistics providers. Conversely, if market rates come in higher than guessed, service providers and sometimes even BCOs lose. Someone must lose, and sometimes the relationship loses too. If things will change, what direction will they go? Well, one popular option for mitigating price volatility in other industries is index-linking. This strategy is already used by US companies on $100 billion worth of products such as oil, corn, gold – even dry bulk shipping. Rather than trying to force-fit the agreed price through the duration of the contract, it is linked to the respective commodity price index. This, of course, requires a reputable global freight index. Working to a floating price may seem an anathema for most BCOs, until you consider hedging. At a market level, BCOs and their contractual partners swap risk using a financial derivative called a forward freight agreement (FFA). It cuts the must-lose dynamic of a fixed-price contract, as neither side is bound to lose when the market price changes. The industry has already taken notice. A small but significant share of survey respondents are currently using index-linked contracts. When asked to look forward, 57% anticipated they would be using index-linking within the next five years. In other words, index-linking is soon set to become mainstream. In an increasingly volatile market, while fixed-price contracts generally work, the cases where they don’t are surprisingly frequently and shockingly expensive. Fortunately, like the iPod, innovation doesn’t stop. Used in conjunction with hedging, index-linking will provide both service and price assurance in the medium-term. That’s why it’s the new go-to for an increasing number of BCOs, forwarders and carriers. Time to go with the stream – same music, better format.